Many of our members have been featured in news stories about their collections in their area papers or on TV. We wanted to share any we are aware of with all of you. 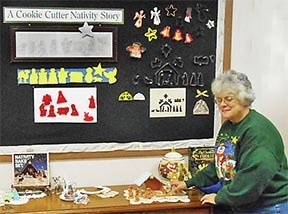 Club member, Jan Johnson, who also collects Nativity scenes, was featured in the Morrow County, Ohio, Sentinel with her collection at Pine Church. Each December Jan and other Nativity collectors in Ohio show their collections to all who visit their display at the church. This year they succeeded in setting a new record for the Guinness Book of World Records. The July 2, 2014 issue of the Austin American-Statesman and Statesman.com online included a collage of 15 photos of Texas collector and club member, Rosemary Clapham, with some of her collection. 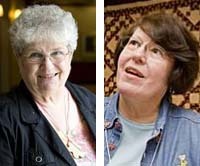 Pittsburgh collector and past president of CCCC, Lynn Maguire, was featured on June 18, 2014 in the Pittsburgh Tribune and in a Trib Live online article about the June convention in Pittsburgh. 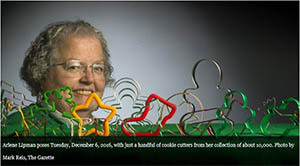 For the Christmas 2012 season, the Christian Broadcasting Co. released a great video starring club members Al Moorhouse, a cookie cutter maker, and his wife Joyce, a cookie cutter collector. Both are members of the club. In October, 2011, Denver collector, Arlene Lipman, was featured in an article by Marti Jatoun in AmericanProfile. The story mentions her collection and how it started and why she continues to collect. The San Francisco Chronicle's SFGate.com featured a story in July, 2010 on the San Francisco, California, 210 CCCC convention and interviewed Joyce Moorhouse of Minnesota and Susan Betz and Janet Manousos of California about their collections. It is with great sadness that we list the members that we have lost recently. They are greatly missed.